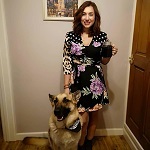 I was brought up in East Devon and first started working in a veterinary surgery when only 12 years old as a receptionist and nurse at weekends and after school. I qualified from the University of Bristol Vet School in 1996 with credits in medicine, surgery, and public health. This was the year of the BBC™'s ,Vet School television program and I could be seen running away from the camera on a number of occasions. My husband always complains that I could have been the Blue Peter vet if I hadn't been so camera shy. My first job was as an assistant to Paul Snelling at Beaconsfield Veterinary Clinic. During the next 10 years, I developed my skills and pushed for considerable modernisation at the practice. In November 2006, I took over as principal veterinary surgeon. My particular interests are medicine, diagnostic imaging, and acupuncture, and I am very experienced dealing with rabbits, small furries, and birds. I live in the village of Christon with my husband, three rescue dogs, and my horse, Wuno. 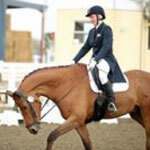 My main hobby is competitive show jumping and dressage. 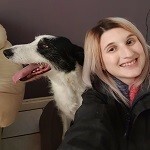 I qualified from Bristol University in 2010 then worked at a companion animal practice in Reading for three years before joining the Beaconsfield family in 2013. I enjoy all aspects of veterinary work, but I am particularly interested in feline and canine geriatric medicine, and also anything chicken related! I am a qualified veterinary acupuncturist as well. At home, I have a fluffy cat called Millie and a cocker spaniel called Gary who you may also sometimes see behind reception at the practice. 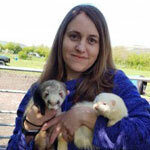 After graduating from Bristol University; I worked in Norwich for two years at an exotics referral centre, increasing my experience in reptiles, birds and small mammals. I even used to see the odd amphibian or fish! Since then, I returned to the West Country and workedin North Bristol for 9 months before coming to join the wonderful team at Beaconsfield in 2019! My main interest is exotic species and love to see your pets with fur, feathers, scales, spikes or shells. I love the challenge and variety of exotics and am happy to see pretty much any species of animal! I have a particular soft spot for Rabbits. 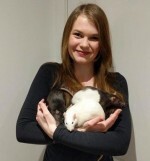 At home I have three cheeky rescue rats called Drax, Nebula and Nova. I started doing work experience at Beaconsfield when I was 14 years old. 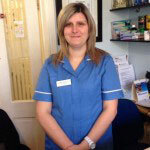 I became a Saturday receptionist when I was 16 and eventually moved to a Saturday nurse whilst completing my veterinary nursing degree at Bristol University. Between finishing my degree and 2016, I have worked at a few other practices which has broadened my experience. I returned to my Beaconsfield family in 2016 sharing the position of Head Veterinary Nurse with my friend and former colleague, Jodie. It felt like I had never left. I have my own menagerie of animals which includes two beagles, two cats, two guinea pigs and a horse. 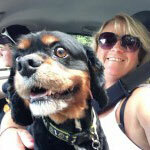 I have been at Beaconsfield Veterinary Clinic since 2008. I began my training here by completing the Animal Nursing Assistant course and then qualified as a Registered Veterinary Nurse in 2012. I enjoy all aspects of veterinary nursing, but I have a special interest in exotic animals and have completed the BSAVA Veterinary Nurse Merit Award in exotics. 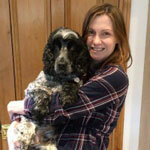 I run our puppy socialisation parties and really enjoy helping our clients and their pets through our nurse clinics. I have a special interest in rabbits and have four of my own. I also have three guinea pigs, three cats, two gerbils, two cockatiels, and two collie dogs. I have been qualified since 2003, and joined Beaconsfield in 2005. My particular interest is in birds, as I previously worked for a specialist bird vet. I am also a qualified pet health councillor. 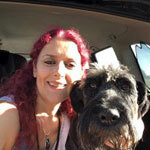 I have a cat, rescued through the surgery, and one standard schnauzers, who I enjoy walking in all weathers. 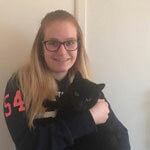 I have worked at Beaconsfield since 2011 on reception and as a veterinary care assistant. I am now the practice student nurse and very much looking forward to qualifying in 2020! I have two gorgeous cats, Maui and Elsa, who I re-homed from here as strays and I have a tarantula too! I am also a mum of two young girls, who keep me on my toes! In my spare time I enjoy spending time with my friends and family. I joined Beaconsfield in January 2019, however, I have spent my weekends volunteering at the practice since August 2018. Previously working in Marketing, I decided that it was time for a change and wanted to chase my childhood dream of working with animals. I absolutely love working here! At home, I have a beautiful German Shepherd, Barney. 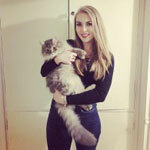 I also share two cats with my boyfriend; a big fluffy black cat named Sullivan and a sweet Bengal Cross called Moomin. I joined the practice in February 2009 and while working here, I trained as a veterinary care assistant and qualified in July 2011. Since becoming more involved with the animals and working more closely with our vets and nurses, I have found a job I am extremely passionate about and want to stick with for the rest of my career. I have three cats, Bobby, Paisley, and Pumpkin, who were all from one of our many stray litters and were born in a greenhouse. I also have three guinea pigs, two rabbits, and a number of fish. Having the opportunity to work as a VCA and playing a part in helping an animal get better puts a smile on my face and makes my job worth doing. I studied Animal Management at Weston College and came to Beaconsfield for work experience in 2016. Since then I completed a Veterinary Care Assistant qualifiction at Bridgwater College and am now fully qualified. In my spare time, I like to care for my two rabbits and two cats. 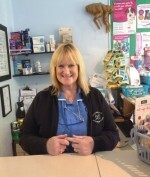 I have worked on reception here at Beaconsfield Veterinary Clinic since 2006. I love working on reception, getting to know both our clients and their animals. I have a dog called Winnie, who is a lively 7 month old spaniel cross. I also have two black cats, three miniature shetland ponies and two guinea pigs...I have no room for anymore! I started voluntary work here at Beaconsfield in September 2013 as part of a college course as a veterinary care assistant. Once my course had finished, I was offered a permanent job as a receptionist which I love. 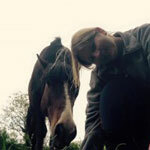 I've been brought up around animals all my life and done lots of voluntary work and fostering. I currently have four cats, two golden retrievers, two English lop rabbits, and four guinea pigs. All of these are rescues. 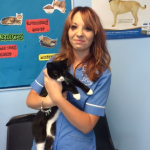 I joined beaconsfield as a receptionist in June 2018, I am hoping to progress onto the veterinary care assistant later this year, I would like to then go onto become veterinary nurse. I love working as a receptionist meeting clients and their wonderful pets. I am a mum of two beautiful children which drive me insane at times but I wouldn't be without them! I also have a collie x called lola and two Guinea pigs called waffle and chocolate. I have been working on reception here at Beaconsfield Veterinary Clinic since January 2015. 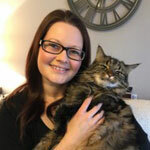 I thoroughly enjoy meeting clients and their pets and being a part of practice life. I have a border collie, called Riley, and also gained a cat from Beaconsfield called Marli. He has fitted in very well at home regardless of only having three legs.